Today is Halloween, and I try to celebrate every year by reading Johann Wolfgang von Goethe's classic poem, "Der Erlkönig," one of the creepiest poems this father/ German teacher has ever read in any language. 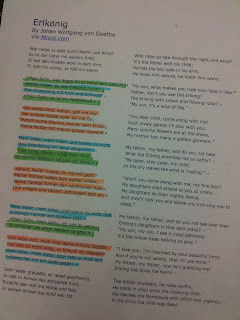 The poem tells of a father riding through a dark forest with his young song held in his lap. 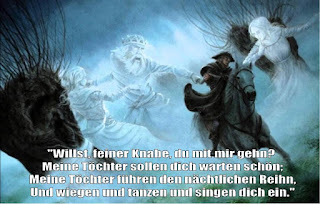 As they ride, the son sees the Erlkönig and hears him speaking. (Most dual translations translate this title as "Elf-King" but I prefer to go with "Demon-King" considering what transpires in the poem.) The Erlkönig beckons the boy, promising a golden shawl, beautiful girls to dance and sing with, flowers. 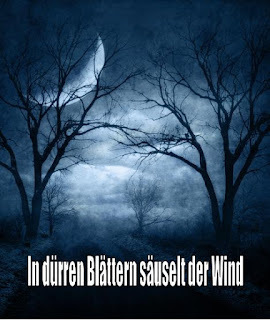 As the boy relates these messages to his father, the man dismisses the sounds as those of nature--blowing wind, rustling leaves, wisps of fog (Nebelstreif, such a cool word). 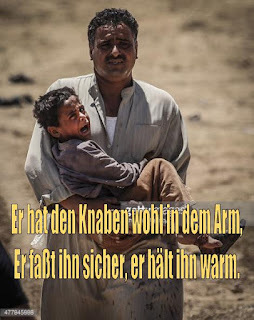 In the last stanza, the boy is moaning, the father approaches the home only too look down in his arms and find his son dead, his life stolen away by the Erlkönig. I like to read the poem out loud for the class first. Today I gathered them into a circle, making sure there were no distractions. 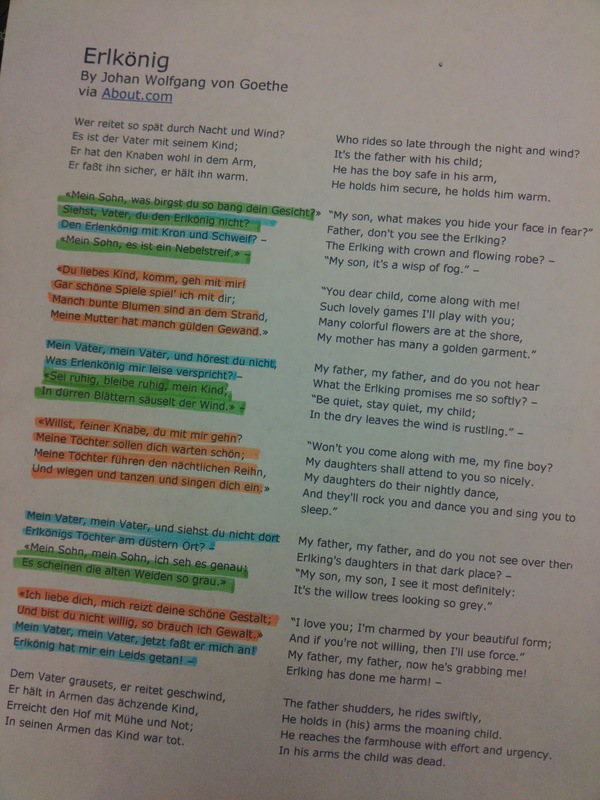 I have a highlighted version of the poem, which helps me to perform the voices of the father, the boy, and the Erlkönig, which I perform in a raspy voice. At the end, I asked if students recognized any words. We just finished a unit on family members, so they pointed out Mutter, Vater, Sohn. Quite a few recognized the key, final word, tot (dead) from other cultural assignments. This became a good starting point for discussion. 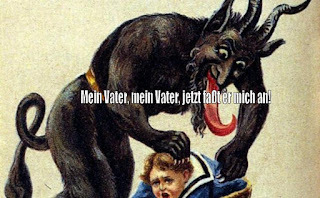 Next, we took a look at a dual German-English translation. Going into greater depth of the words. Here, I'm trying to point out onamatopoeia such as säuselt (rustles) and faßt (grabs), and point out the similar sounds of rhyming words--especially those that look different to American eyes like Gesicht/nicht, and Arm/warm. This can really help with pronunciation. The last step was to create memes using excerpts from the text. This is one of my favorite lessons, because it is multimedia and it plays to students' basest 21st-century desires--to "go viral." I have long had trouble making memes. I have a Chrome app that makes memes, but I have never been able to make them in Google Drawing, which I prefer, because it makes things easier to share. Last night I finally broke down and asked YouTube. Within three minutes, I had the answer--HINT: insert Word Art instead of trying to find a meme font as I had wasted countless days trying to do. Here's the video I watched. 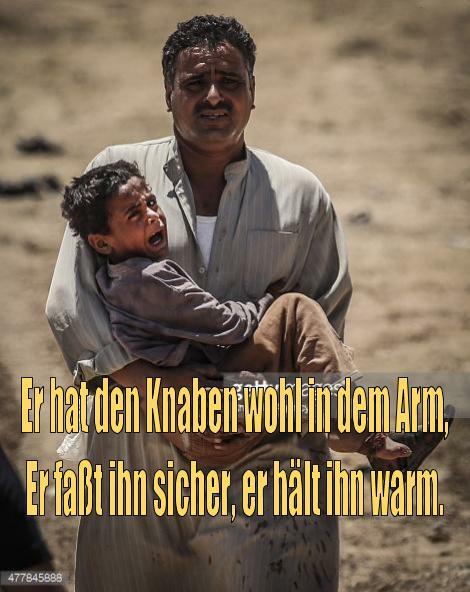 I went for serious with my meme, first finding an image of a refugee father carrying his son. The looks on the faces of the boy and the father closely match what I imagine them looking like on Goethe's terrible ride. While students searched for images and created memes, I played them this video of a Schubert Lied based on the poem (I love the illustration here, very clever). Here are a few of the memes that kids turned in. We reviewed them as a class, providing one last, deep look at this all-time horror classic. Happy Reformation Day, everyone! Und fröhe Halloween.